Global Financial Training Program provides a full service training that puts people into the business of providing loans from $5,000 to over $500 million dollars to businesses and real estate investors that are getting turned down by the bank, while earning you commissions up to 15%. Every Business In America Needs Money Sooner Or Later! And You Can Provide The Solutions! 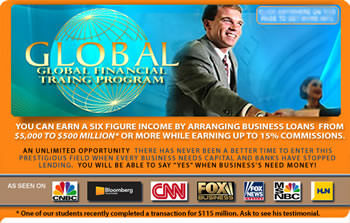 GLOBAL, a nationally recognized company with over 36 years’ experience in the lucrative field of commercial finance, has developed a simple program to train you in making a high annual income by providing all types of commercial loans to real estate investors and businesses that need money… and nearly every business in the world needs money to survive and grow…especially in these economic times. We'll teach you how to be your own boss and run your own business. We'll supply you with everything you need to hit the ground running and start earning the high annual income you deserve immediately after finishing your training. That means you will be in the position to start closing loans the very next day. You can provide loans from $5,000 to over $500 million dollars with commissions up to 15%. For example, if you provide a $100,000 equipment loan your commission would fall somewhere between $10,-15,000. If you close just one deal a month you are already in a six figure income. You will be closing more than one deal a month but it is no surprise why people in the Finance Industry do very well. As a full-service finance company, you will be providing a valuable service for clients. You'll be able to provide all types of financing Equipment financing, Working capital loans, Accounts receivable financing, Unsecured lines of credit, Commercial real estate loans, Hard money loans, SBA loans, just to name a few. Most important you don't need to be expert in any of these types of loans. All you really need to be able to do is "listen". To understand a business person's needs and situation and to communicate it to one of our "core" Lenders. In this industry it's possible to make more money in one cell phone call than most people make in a month! It's easier than you think to be fulfilling your dreams of independence, living the life you deserve and enjoying the prestige of owning your own company. You don't need prior experience, just the desire to be your own boss, the ability to learn, good people skills, and a passion to succeed and make a lot of money. How much is up to you! Some people work part time from their own home but once they see what can be made, many quickly go full time easily earning a six figure income. We equip you with all the tools you'll need to find clients. Let's face it, Marketing is probably the most important function of any business and we spend more than a third of our training showing you the many tools you have at your fingertips to rapidly get clients. You will learn how to leverage the POWER of the Internet to reach thousands of clients. You will learn how to "zero in" on your best most profitable clients. We will go over all of the marketing tactics allowing you to gain more leads quickly and easily. In addition, you will leave with a state of the art website, company branding package, social media setup and posting and much, much more. You can do this part time, full time or even as an add-on to your existing business. You'll deal over the phone with companies all over the nation so there is no need for an expensive office or high overhead. You can even make money while you travel or go on vacation since all you really need is the ability to receive phone calls, speak to clients and follow up when it is most convenient for you. We've been in the finance business for over 36 years. Our knowledge and expertise far surpasses anyone else in the industry. We have made all the mistakes and created a program so you can start your business without having to figure it out on your own. We do not text book teach, we teach all of the marketing and good business practices directly from our day to day experiences. Text books get old quickly, our method of teaching will we keep you up to date as to what is going on in the industry…right now! You will be pre-approved with over 35 premium lenders to allow you to do business starting from day one. No need for the usual 3 years industry experience or multiple references. These requirements are waived the minute you become a “Global Graduate”. You will directly with your lenders, submitting your deals directly to them and collecting your commissions directly from them. No middleman to share in your commissions and best yet you get paid when the loans fund. Global is not a Franchise. After the upfront training fee there are no ongoing fees. The only thing on-going is your support. Once you graduate, you are automatically enrolled in the Global Mentorship Program which provides1:1 lifetime support and transaction review. If having a great life, making a great living, working where you want, when you want, part or full time sounds interesting then fill out the information. We'll send you links to our website which is filled with detailed information and videos that make finding out about this extraordinary opportunity easy. Our goal is to give you a chance to learn about this incredible opportunity that will allow you to finally realize your dreams of success, having a life that affords you time for yourself, your family and your friends. NOTE: This franchise is not currently being offered to individuals with less than $20,00 to invest. Global Financial Training Program is currently accepting inquiries from the following states: Wyoming, West Virginia, Wisconsin, Washington, Vermont, Virginia, Utah, Texas, Tennessee, South Dakota, South Carolina, Rhode Island, Pennsylvania, Oregon, Oklahoma, Ohio, New York, Nevada, New Mexico, New Jersey, New Hampshire, Nebraska, North Dakota, North Carolina, Montana, Mississippi, Missouri, Minnesota, Michigan, Maine, Maryland, Massachusetts, Louisiana, Kentucky, Kansas, Indiana, Illinois, Idaho, Iowa, Georgia, Florida, Delaware, Connecticut, Colorado, California, Arizona, Arkansas, Alabama.